Bathroom Taps | Bathroom Takeaway 5% discount? 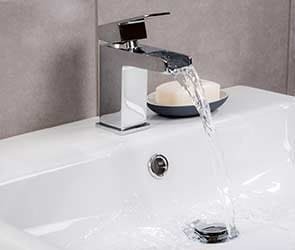 Browse through our wide range of taps add the perfect finishing touch to your bathroom. Whether you are looking for that certain minimalist effect or hoping to capture the character of the room, we have a wide range variety of taps and tap packs to match your expectations. Our taps not only come with the confidence of our 10 year ‘Fit & Forget’ guarantee but look to add that bit of sparkle & shine to the rest of your room. ###H2###Bathroom Taps###/H2### Whether you are looking for a matching basin and bath tap, basin waterfall taps or even a new kitchen tap, Bathroom Takeaway offers a huge range to choose from. The perfect tap provides the finishing touch to your room, whether that be your kitchen, cloakroom or bathroom suite. All of our taps come with a stylish chrome finish and a 10 year ‘Fit & Forget’ guarantee, so you can be confident in the quality. ###BR######BR### At Bathroom Takeaway, we are aware that taps can be one of the biggest expenses when redesigning your bathroom. As always, we offer everyday low prices on our bathroom tap selection and prices start from as little as £22.97, so you can redesign the bathroom of your dreams, without worrying about the cost. 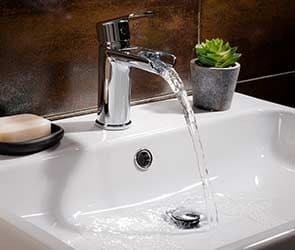 ###BR######BR### ###H3###Types of bathroom taps###/H3### Taps are probably one of the most important features in a bathroom and while it may seem like a tap is simply there as a source of water, there are so many options to choose from that it can be difficult to know which one is most suited to your bathroom requirements. ###BR######BR### The most popular type of bathroom sink tap is probably the mixer tap. 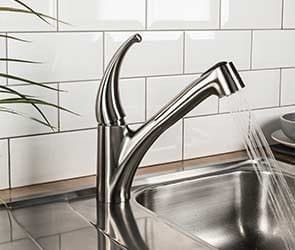 A mixer tap works by mixing the hot water with the cold before it leaves the faucet, therefore reducing the risk of scalding. These taps commonly come with one lever handle, but are available in a variety of designs, including the waterfall style, or for a more traditional bathroom, Bathroom Takeaway offers a range of basin mixer taps with the classic crosshead design. The mixer tap is perfect for a family bathroom. ###BR######BR### Pillar taps are also extremely popular, different to the mono mixer tap, they are standalone taps and have separate valves to control the flow and temperature of the water. 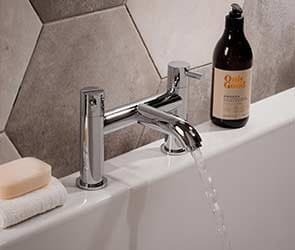 Traditionally, pillar taps have a crosshead design and are therefore ideal in a vintage style bathroom. However, more recently designs have changed and they are now available with angular edges that fit perfectly in any modern bathroom. ###BR######BR### Whilst most bathroom taps are deck mounted, new ranges include wall and floor mounted bath taps. Floor mounted, or freestanding taps are most commonly used for combination shower baths and unlike wall or deck mounted taps, the full tap is exposed. One of the main advantages of the wall mounted tap is that the bath or basin can be placed anywhere in the room. 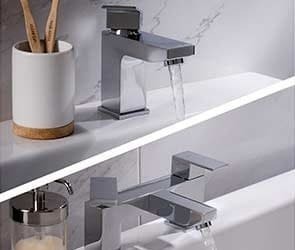 Wall mounted bathroom taps are very contemporary and look perfect in a minimalist bathroom, thanks to the workings of the tap being hidden behind the wall, this also makes them very easy to clean. ###BR######BR### Thermostatic mixer taps are mainly used as shower taps due to their ability to maintain the same temperature. Similar to a mixer tap, the thermostatic valve mixes hot and cold water together to provide your chosen temperature. It can then re-adjust if there is a change in temperature or pressure, maybe due to anther tap being turned on in the house. This minimises the risk of scalding and makes your shower safer and more economical. ###BR######BR### If you are purchasing a bathroom suite and would like a unified design across your room, we also have a number of bathroom tap sets, offering a matching collection of basin and bath filler or bath shower taps. ###BR######BR### ###H3###Kitchen sink taps###/H3### At Bathroom Takeaway, not only do we sell a wide range of bathroom taps, but we also offer taps for the kitchen area. Our range consists of mono kitchen mixer taps, pull out rinser taps and instant boiling water taps. ###BR######BR### Pull out rinser taps offer supreme versatility and performance in terms of a kitchen tap. They are one of the most popular kitchen tap designs and offer a sense of contemporary style, perfect for a kitchen with a modern design. However, as well as looking good, the pull out rinser taps are also very practical. The pull-out hose attaches to the side of the tap when it isn’t in use, keeping your kitchen sink neat and tidy. ###BR######BR### Mono mixer kitchen taps are both minimalistic and practical. The range available at Bathroom Takeaway feature a chrome finish, therefore making it the ideal companion for a stainless-steel kitchen sink. With a range of single and double handle lever taps, the mixer taps fit perfectly with any style kitchen. ###BR######BR### ###H3###Tap features###/H3### At Bathroom Takeaway, we pride ourselves on offering the best in terms of quality. That is why all of our products are manufactured using the highest quality materials. Thanks to its durability and capability of withstanding corrosion, brass is one of the most popular materials in the production of taps. At Bathroom Takeaway, all of our taps are produced using brass and finished with either a high-quality chrome or brushed steel exterior. ###BR######BR### All of our tap collection features ceramic disc technology. Whilst older taps used rubber washers, over time they degrade and can leave you with a dripping tap. Our ceramic disc technology means that you only need to turn your tap a ¼ turn and it will turn off, preventing dripping taps. ###BR######BR### ###H3###Wastes & Fittings###/H3### After purchasing a kitchen or bathroom tap, another consideration is the bath or basin waste. 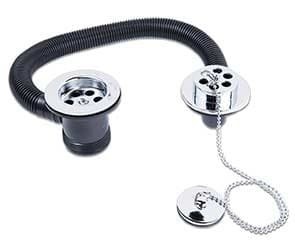 At Bathroom Takeaway, we have a range of traditional plug and chains, strainers and more modern pop-up basin wastes, that will perfectly complement your bathroom style. The majority of our < sink plugs feature a chrome finish, to perfectly blend in with a white ceramic or stainless-steel sink, however we also offer a small range of gold finish plug and chains.###BR######BR### ###H3###Quality Guarantee###/H3### As well as offering every day low prices, as opposed to seasonal sales, Bathroom Takeaway offer a 10 year ‘Fit & Forget’ guarantee on all of our products. This means you can be confident of the quality of your products and know that you are protected for years to come.